I tried to mainly communicate via email, as personally I found it easier to ask more direct questions that I wouldn’t of had the courage to ask, probably even over the phone and definitely not face to face. This also has the benefit that people are then giving you a written record of their answers. This can then be added to your evidence and referred back to. This makes you more powerful. This makes people take more notice, as they can see you are serious about the situation and you are not going away quietly. I’m totally convinced that this fact makes a difference. Face to face meetings are really good too. All the people I have met in the Education System during this battle for support, from Teaching Assistants up to Case Workers at the Local Authority, have all been really lovely and when I met them face to face I could see that they all really want to help. This makes it easier to then email them looking for support. It makes things more personal, and helps you feel like they are on your side. This also increases chances that your case is really be heard and understood. When going into meetings I typed up a list of questions, worries, all the points I want to get across, all the facts about how Josie is struggling. I printed off several copies and handed them out at the meeting when I was asked what I wanted to say. We then all worked through the list, and everyone also then had a copy of all my facts to take with them after the meeting. I did this as I have a terrible memory, and as soon as someone asks me if I have any questions, my mind goes completely blank. I can’t read from questions during a meeting, as I found I just skip ones that I’m too shy to ask. So if its on paper then I have to continue being courageous, and it really worked for me. I have an gathered an unbelievable amount of paperwork, so I made notes of what I thought were the key facts from all the meetings and reports I gathered over the last few years. I kept each separate page headed up with who said the fact, what date, and whether it was a meeting or assessment. Literacy skills below 1st percentile, Underlying language problems, Vocabulary score is very low, she did better in her analogies sub test than her vocabulary (which is unusual), really really needs specialist tuition, needs school with smaller classes, it’s not the way she hears the sound its the way her brain processes them, scored low on understanding spoken paragraphs retaining information and understanding it and answering questions, emerging emotional needs due to being isolated from peers for learning difficulties, requires information in small chunks, meets criteria for the registration as a child with disability, most tests were 50th centile, delayed test 80th centile, reading 2nd centile, precision teaching, needs high level of monitoring. For me I think the most powerful facts I could use were reading age and what level she was working at in school. 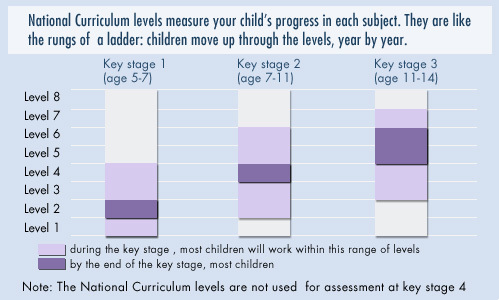 Here is a chart of the school Key Stages, and the levels that children progress through. Each Level is then divided by letters (just to confuse things); so when they are in Year 2, they should be around Level 2a, 2b or 2c, a is the highest, which then goes up to Level 3c. By Year 6, they should be around Level 4a, 4b or 4c. Key Stage 4 is then assessed by GCSEs.